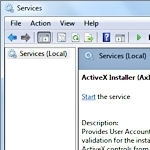 The Services tool is one of Windows’ Administrative Tools, a suite of professional-quality, system-management utilities used to adjust and control many of the operating system’s essential functions and features. Starting with XP, these tools are either built into Windows or are offered as free add-ons. This guide to using the Services tool is the fifth installment in our Windows Administrative Tools series. Part One of the series explains what the tools are and how to make them easily available from the Windows Start menu. Part Two discusses Windows’ Performance Monitor, which reports in real time what’s happening within the OS as programs run — or fail to run! Part Three describes how to use Windows’ Memory Diagnostic tool to thoroughly test your system’s random-access memory. Part Four shows you how to use Windows’ Task Scheduler to run almost any program automatically, at the time and in the way you choose. For this article on the Windows Services tool, I’ll focus mostly on the Win7 version because that’s the OS most Windows Secrets readers are running. But don’t worry — Windows XP’s, Vista’s, and Win8′s Services tools are very similar. So what’s a Windows “service,” anyway? Windows, like most operating systems, is a collection of hundreds of smaller programs. Windows Services are some of those smaller programs; they’re a special kind of software that runs in the background and provides specific, low-level functions to the operating system — and to other programs. To put it another way, services are the software that lies beneath the veneer of the user interface. Services do the real work of running your PC — including networking, power management, hardware detection, cryptography, print spooling, security, and hundreds of other essential functions and features. Right now, your Windows system is probably running about 150 services. (I’ll show you how to take a look at them in a moment.) The number of services fluctuates, depending on what you’re doing and what software you’re running. Many services operate in daisy-chain fashion; they depend on other services for their input and deliver their output to still other services. This concept of dependency chains — services depending on others in order to function — is a key troubleshooting concept we’ll come back to later. Many services start at boot-up and run continuously until shutdown. Others run on demand, triggered directly by a program or indirectly by a user action. The number of services your system is running at any time (and what those services are doing) has a huge impact on system performance. For example: Long, slow boot-ups often result from too many services trying to load and run at the same time, during system start-up. Which brings us to the Services tool: It lets you explore and control the services running on your system. Windows Secrets windows services. permalink.